« A fair cop for “THE FUGITIVE”..! The BBC announced yesterday that Poldark is to be remade and will hit the screens in 2015–the 40th anniversary of the original showing. Amazing news for everyone who loves a good story, for fans of the original, for Cornwall and for a whole new generation who are unaware of the rich pickin’s in Winston Graham’s saga. His stories and characters are still being enjoyed 70 years after he wrote the first book in 1945. They still stand up–as many who contribute to this blog bear witness. Our Winston was a master storyteller and we, the original cast, were lucky to be involved. Mammoth Screen is the company producing the new version. They have recently been responsible for Parade’s End and Endeavour (the prequel to Morse). Both period pieces done with a care and attention to detail that bodes well for the remake of Poldark. Winston would have liked this explanation and I’m sure would have joined me in wishing Good luck to everyone involved in the new project. Cannot wait to see Poldark return. Watching the series introduced me to a wonderful reading adventure and I do not read fiction as a rule. Is it really 40 years? Never! We are more than ecstatic! But nothing can top the original…. So, do you think Dennis will dump you on your Bum again??? Let’s hope they approach you to do a cameo in the new prodcution! A fitting tribute to your splendid portrayal in the “original” series. The cameo is a great idea! Thanks for the generous announcement. But for many fans, there is only one Ross P. You had just the right mix of class, brawn and self-interest going in, and allowed Ross to get battered by circumstance, and love. Your portrayal of Poldark captivated me, it was full of passion and intensity. I hope the new series can find an actor who does the same! Best wishes to you Robin Ellis and thanks for such great memories! I was looking for the word “continuation”…and not “remade”. Great news! This will also ignite a renewed interest in the original “Poldark” and introduce an entire new audience to it! Oh, this is fantastic news!!!!!! Can’t wait to see it! I hope the new production does Winston Graham’s saga justice as the first one did so well. Will it really be 40 years in 2015 since Poldark first hit our TV screens? I was only 12 in 1975 but I was hooked from the opening music. Perhaps we will see you on TV again Robin! They are going to have a difficult time finding an actor to match you as Poldark. I hope you have a cameo role. A new Poldark?? hmmmmm. Perhaps. Nothing could ever compare to the original. And no one could ever replace the image of Robin Ellis as Captain Poldark in my mind….never ever. Robin IS Poldark, and Poldark IS Robin. Perhaps I can enjoy a new version of the tale, and perhaps even still have a tears in my eyes and a smile on my face and laughter in my soul while viewing it….but it could never replace in my heart the image of Robin Ellis as THE Poldark of Cornwall. And of course the dear Angharad Rees and Richard Morant. A new Poldark?? Perhaps. I only have one question – will you, Robin be in it? I’d like to see Poldark riding again in ‘them boots’ oh yes indeed I would…..
i fell in love with the original cast of “Poldark” – one of my all time favorites!!!!!! Robin, I think all your true fans should be cast as extras! I can totally play the wife of a tin miner!!!!! Or one of the servants. I just can’t believe this news!!! My only hope is that you make a brief cameo, or maybe a reprise the role! Hurray and thanks for this news! I AM SO DELIGHTED WITH THE NEWS OF THE POLDARK REMAKE. I CRIED WITH HAPPINESS AND SADNESS. HAPPY TO HEAR OF THE REMAKE BUT SAD THAT THE ORIGINAL CAST ARE NOT ALL HERE WITH US, I WOULD HAVE LOVED ALL THE ORIGINALS TO HAVE HAD IF NOT A LEADING ROLE A CAMEO ROLE. WHEN THE ORIGINAL SERIES WAS ON TV MY DAD AND MUM TOOK ME TO SEE “POLDARK COUNTRY” CORNWALL, I FELL IN LOVE WITH EVERYTHING ABOUT THE PLACE. INFACT OUR HOME IS UP FOR SALE AND WHERE ARE HEADING FOR—– POLDARK COUNTRY. This is exciting news! I will watch the new production – hope they get the actors right(!) – but the original will always be special to me. I cut my teeth on British actors in this production and fell in love with the story, acting, costumes, scenery, etc. Oh dear – why does my mind fill with dread. Make way for a short blonde Ross… the original will always be the best. Check out facebooks a passion for poldark. Its never seen so much posting in such a short time. We are ‘coming out of the woodwork’. So excited. Better get the casting right or there will be trouble!! This announcement just as McNeil has finally caught you! What timing. Is a cameo role really on the cards? I sure hope that the remake lives up to the original. Remember the one made after the original series in 1996 that didn’t do so well? 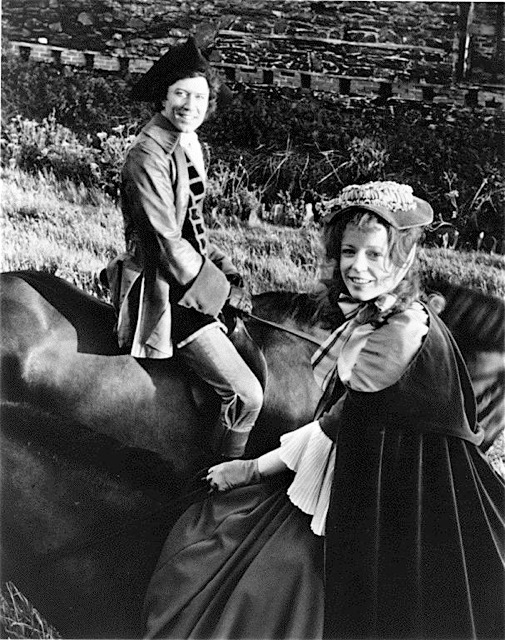 Can’t imagine anyone but Robin Ellis as Ross and Angharad Rees as Demelza, but I’m glad for the remake. Just sayin’ they’d they’d better find actors really, really great to play these parts. Also would love to see a cameo from Robin. Can’t wait. I cannot imagine any two people having such great chemistry as Robin and Angharad, the only other people on screen who have come close are Colin firth and Jennifer Eley in the 1995 Pride and Prejudice. Goodness it will be a tough act to follow……………. I couldn’t have said it better myself. After viewing the Knightly version of Pride & Prejudice, I couldn’t agree more. Totally agree with you Chris…Kira Knightly as Lizzy was just not the same as jennifer Eley… She brought her to life. They are facing a difficult task in attempting to replace you for another actor to play “Poldark” – you matched the part so perfectly. I sincerely hope they have the good sense to engage you once more to lend your magnificent acting skills in bringing one of the characters in this production to life once more. I would really look forward to seeing another Poldark performance from Robin Ellis! Ok..I am rather worried about this. I come from a theatrical background (actress) and I KNOW good quality productions when I see them,and POLDARK was a rare gem! The casting was brilliant, you had remarkable chemestry with Angharad, the direction, the characters, the music- all of it was superb. This remake can be successful- **IF** it is done by people who know what they are doing. It reminds me of Gone With the Wind. Why bother remaking GWTW when the original was such a masterpiece? However, there are some really good remakes like Little Women , Cape Fear and I am anxious to see the remake of The Great Gatsby with Leonardo de Caprio- I am torn on this whole idea because so many remakes are awful. Personally- I cannot imagine another “ROSS” besides YOU Robin. This actor dude is going to have some talented, charismatic shoes to fill. They had BETTER give you a good role- even if it’s a small one. (Listen to me – acting like I am in charge! LOL) I also hope it isn’t one of those “cool” productions where they bring in hip hop music and other gimmicks to make the “kids” like the story. I saw the film version of Les Miserables and thought it was incredible, and I was very happy to see that Colm Wilkinson (the original Jean Val Jean in the stage play) was given the role as the Bishop . I hope you are offered something like that. Yes, we Poldarkians take Poldark very seriously and are protective of it. I never could bring myself to watch that “trash” version of Poldark where they replaced all of the actors when most of you were available. I just couldn’t do it. Since Mr. Graham has passed away- I hope they ask YOU to be an advisor on this project. It’s so sad to me that they couldn’t have used the original actors and had them age gracefully in the roles as the novels progressed. I wonder if the success of Downton Abbey had anything to do with the undertaking of this new production? We Poldarkians will be watching and hoping for the best. I would be happy if the new version was successful also. Wow! Big news, indeed. I echo the comments above. When there is a special collaboration as there was with Poldark the original, it will be hard for us to watch. You will always be in our hearts! However, if it is a good production, and the younger generation is inspired to see it, more power to it! Maybe some will be inspired to watch the original 2 series again!! Who knows? I don’t know, the original was pretty wonderful, and You ARE Poldark. That being said, I look forward to the story, and seeing Cornwall again, and I’m all for a Cameo for you. Robin, you will always be “my” Ross Poldark, but somewhere out there is a 13 year old girl waiting to fall for hers, just like I did. Can’t imagine that the new series will hold a candle to the original, but it will be interesting to see a new take. It can’t help but bring new readers to WInston’s books as well. I’m so glad you keep us all updated on your life and activities. Keep up the great work! (Loved the video with Captain McNeil). As far as I’m concerned, there is–and will forever be–only one Ross Poldark. I will have to be frog-marched into the living room, grumbling all the way, to watch the new show. But I’ll give it a chance! I always say Never change a winning team, so I hope that they casting as much as possible actors of the original series.Sadly some past away R.I.P. I hope dear Robin that they give you a very important part, because infact you where the star of the series and you deserve the best part together with Donald aka Captain McNeil. Adding my sentiments that Ross Poldark is Robin Ellis.. He and I are “of an age”…and he and the rest of the cast,…every one of them….was well-cast. I loved the series. I am reserving judgement on a “new” one. I just dont see the point, frankly. it couldnt be improved as as far as I can see, and may therefore end up being a big waste of money. A role for Robin in it?? Sounded like a great idea at first, but as I mull it over, I think “only if it a masterpiece”. The stories of Poldark were wonderful, but what brought them to life, in my mind, was the original cast. Remaking the stories seem like an attempt to remake “Gone With the Wind” – Tom Cruise as Rhett??? I don’t think so! But good luck to them. I think I will stick with the two years of Poldark that I play again, ever so often. How can it be better than that? Well, you know what happened to the sequel to “Gone With the Wind”. Very seldom is the remake as good as the original. I will watch it but I will not buy it. I have my “POLDARK’. Since my husband’s family is from Cornwall, I loved introducing him to Poldark recently. He’s not much of a TV watcher, but it became a fun ritual for us to watch a few episodes per night! I loved Parade’s End and hope they bring that same quality to such a beloved classic that I watched as a young woman in the states way back when! 🙂 Here’s hoping you have some face time in this new version!! Why tamper with perfection? They’d be wise to remember your legion of fans who will not take kindy to them mucking it up! Would you repaint the Mona Lisa?? Excellent point!!!! That sums it up perfectly! : “Would you repaint the Mona Lisa? ?” The only flaw in the original series, in my humble opinion, is the change in actors, such as the departure of Richard Morant, etc. Interesting news! Recently I watched the remake of “The Forsyte Saga” on DVD’s and it was really good. But in case of Poldark I agree with other comments here, it can’t top the original. 2015 in the UK so I suppose 2025 in Germany 😉 Nowadays German speaking actors playing English people in Cornwall. Yes, it’s sounds bizarre but Rosamunde Pilcher films are very popular here. Mostly you can forget the stories but the shown landscape is great and so it’s good for Cornish tourism. The new producers owe you, Robin a debt of gratitude, for staying in the public eye and keeping the original Poldark series alive in the public’s mind. I hope they properly acknowledge that in whatever manner you’d prefer. I wish the BBC all the luck in the world with this new production but IMO no actor will ever play the Ross Poldark part as well as Robin did. on May 10, 2013 at 10:00 pm | Reply Dianne P.
Everyone’s said it before me–they’ll never be able to top the original–it’s a classic! But it might be an interesting few hours. Whoever plays the lead better be tall, dark-haired, & handsome–it took awhile for me to get used to a blonde 007, despite Daniel Craig’s talent. I’ll give it a whirl, I guess – and hope that a new generation falls for The Poldark Saga… But it’s like trying to recast Casablanca! My mom says, “Why ruin a diamond?” If they do it justice, we’ll try it – with trepidation. Robin, it will never be as good as when you did it. The remade Forsyte Saga was a disappointment to say the least although it was in color. Sorry Damian Lewis, but Soames did not have red hair; and Irene was miscast as well-Gina McKee -a fine actress but not believable as a woman of such physical and spiritual beauty that she could attract any man in the room. I admire your generosity in wishing a new generation well with something which was so important in your life. I will certainly give it a trial, but if the quality does not at least equal the original I will turn it off and read a book instead. I look forward to a new Poldark…BUT…If they have to do it justice and cast it well..It would be so sad to see them muck it up cause its such a national treasure for a lot of people..
Hope they give you an Alfred Hitchcock type cameo, but you will always be my Ross. I didn’t know they were making a new “Poldark”. Don’t think they can beat the original series. You all made the characters your own but I wish them luck. Recently, I saw “Marnie” starring Sean Connery–surprised to see that Winston Graham had written the novel. Sorry to read that Richard Morant had died. I remember him as Flashman in “Tom Brown’s Schooldays”—I’ll never forget that performance. Great stuff! The actors in the original acreen version weaved the magic that spun Winston Graham’s tapestry of human emotions and vibrant characters into life. Part of Sundays stopped for ‘Poldark’ viewing – this in the days before video recorders let alone Sky plus etc… Such was the success of the series and it’s unmissability. It will be interesting to see the new version – but for those of us of a certain age the memory of the original screenings will remain unbeatable. My sister and I are too thrilled for words! We are both huge American fans of yours and we can’t wait to indoctrinate our johnny-come-lately sister into the greatness that is Poldark. Love your recipes, too. Robin, maybe you should move to the Dark Side and make a pitch to play Nicholas Warleggan! That could be fun. …or how about Tholly Tregirls? For me, Robin and Angharad ARE Ross and Demelza. So I’ll stick with the dvds of the original series, thank you very much. on May 11, 2013 at 3:48 pm | Reply Dianne P.
The director really needs to talk to the people on this blog, Myrna, lol! I was thinking: I wonder if there’s a big theatre in Cornwall that could host the premier, haha! Robin & Meredith, we’ll buy the tickets & popcorn (and maybe smuggle in a bottle of good wine!) if you’ll sit with us!! It is touching to read of the impact the programme made years ago. Thanks everyone for this remarkable response to the news of a new production. It is extraordinary to read your comments. The tricorn hat in the cupboard didn’t fit today–back to normal tomorrow! By Jove I’ve got it!! Since a remake of the original series is not needed (it’s already in color), why not take a cue from “Singin in the Rain,” and make the new Polark a musical? They can use the cast from the movie of Les Miz. – the dashing Hugh Jackman as Ross, the waifish Anne Hathaway as Demelza, Sacha BC and Helena BC as Judd and Prudie, Russell Crowe as Capt Mac Neal. on May 11, 2013 at 3:44 pm | Reply Dianne P.
I dunno, Robin–the more I think about it…. The cast has some pretty HUGE shoes to fill. The lead would have to have that “pensive moodiness” that crossed your face so often–who else could pull that off? (Was that acting, or is that really you, Robin?) The closest I could think of was perhaps Clive Owen…well, maybe. And Ross needs that rich, commanding voice that still softens so well by the fireside–right, ladies? And he needs that touch of wanderlust. Again–who?? And who could ever recapture the quiet malevolence of Ralph Bates–we have to loathe him! And the vibrant, bouncy schoolgirl-with-a-crush look of Angharad Rees? The more I thought about it, the more I realized a new production could NEVER fully please us die-hards! It’s like every time they remake Robin Hood. I watch, but am always waiting to see Richard Greene’s congenial, ne’er-do-wrong archer, with a wisp of hair threatening to fall over his forehead. No one else can do it! It’s like trying to find someone to play the Beatles! The best they could hope for, if the cast had even half the talent & “clicked” the way you all seemed to, is that a NEW generation would discover the characters and then would go looking for the original franchise!! On second thought, there IS one way, Robin. Perhaps if you just let your hair grow out a little… 🙂 It looks like Donald’s ready to go! Jill, Judy–are you listening?? You will always be my Ross Poldark! I suppose this will bring a new generations of viewers to see and enjoy this wonderful saga. I’m going to make my daughters watch your Poldark before they can view the new one though. Winston Graham created a complete world in these novels. And he so delicately wove a thread of regret for lost possibilities between Elizabeth and Ross beneath the surface. I hope the new adaptation is restrained, in keeping with the novels and wonderful original series – they will NEVER find such a perfect cast again…………… But Bradley James would make a good Francis and is only a few years too old (Francis and Ross were only 23 at the start of the books). Richard Armitage is too old now, otherwise he might have made a striking Ross……………. It’s wonderful news regarding the Poldark remake. For me the test of a good story is its ability to endure. Imagine 70 years after Winston Graham penned the first book of these wondrous stories and the magic, ever therein, is making it’s way out into the world again! Like the venerable Captain Poldark that you played, you led the way Robin, taking all of us headlong into the amazing world that Winston Graham created in his wonderful novels. I will always be grateful for every one of you in the original production…as you literally breathed “life” into those amazing characters while setting the standard along the way. As we move inevitably forward, I know that Mammoth Screen has done amazing things with “Morse,” “Endeavor” and the utterly captivating “Parade’s End” which I adored. As “Poldark rides again” as you said, I feel fairly confident that those near ‘hallowed grounds” of Ross and Demelza and the family Poldark, is in good hands once again. My mother loved Masterpiece Theater, and she bought the VHS version of Poldark for our home in the early 1990s. She passed away when I was seven, but Poldark remained on our shelves where I eventually discovered it. It became a series that I loved and watched every year without fail—I’d often spend a week every summer going through each part. I admired Ross’ vision and leadership, Demelza’s passion, Verity’s patience, and Dwight’s kindness and humanity. I watched with joy, dread, or hope as characters transformed in front of me. Poldark held a special role in my heart as I grew into adulthood, and I truly wish that my mother and I could have shared the series together as something we both loved. The problem today is that no one knows about Poldark, and my generation has not seen or heard of the series. I am excited for the new Poldark series not only for the opportunity to see how something I love may be once again envisioned, but for the possibility that a new remake will help bring the version I loved to much to the forefront. That people can once again discover you, Robin Ellis, and Angharad Rees and so many beloved actors and characters. Beautifully said, Genia. If I recall correctly, I first discovered Poldark in the VHS version at my local library here in the USA when I was in my 20’s. I instantly fell in love with the story on viewing the first tape, and immediately shared it with my mother, who also enjoyed it very much. As with you, I try and watch the series at least once a year, by myself, or with a friend. It is a shame that most younger folk have never even heard of Captain Poldark and his adventures, but perhaps that will all soon change. Though my heart truly wishes the younger generations could receive the same emotional experiences we had in watching Robin and Angharad in the original series, and not some newer politically correct, socially sensitive, watered down version, overflowing with special effects and CGI. I’m so thrilled and elated to see the response this is receiving! Poldark was and is a wonderful piece of literature. I believe we all can attest to our love for Robin Ellis in the Dramatic rendition. I will ever be a loyal lover of yours! I hope a remake, done well, will attract the younger generation to read Winston Graham’s books but I regret, I must be showing my age. For me the only version to watch will always be the 1970s original. I cannot imagine, and do not wish to see, anyone else playing these roles as, however fine they are as actors, they cannot improve on the original. You can never really go back. Poldark was perfect. A new generation will I hope enjoy the new production but I can’t help thinking that if the BBC wanted to film a drama set in Cornwall there are other tales they could tell. Poldark was my all time favourite .. I do not want the memory of that series spoilt by what I fear will be an inferior programme. You are so right Jose! There are so many wonderful tales that could be told I wonder why film makers desire to play with perfection? In Hollywood it seems as though they have nothing original. I love the BBC for their classic programs. I do wish they would leave Poldark alone. There could never be the chemistry like the original. We love you Robin! Ditto all the above. There is only one Ross Poldark, and that’s our lovely Robin. A hard act to follow! Robin, your remarks about a remake of “Poldark” illustrate you truly are the epitome of a gentleman. Personally, I believe they should leave well enough alone. The original series is a treasure, with outstanding performances informing a beautifully written story. There is no way it could be improved upon. If I were you I would be sputtering with indignation. But instead, you express generosity and good wishes. What a lovely man you are. It makes me inexpressibly sad that so many of the talented individuals involved with the original series are no longer with us. They cannot be replaced, nor should any attempt be made to do so. But I suppose potential profits will always out, no matter how ill advised a project is. Hello Sylvie–new covers required! It is terrific news. I just met with the team from Mammoth Productions who are doing it. It could not be in better hands. mixed feelings about this, torn between loyalty and curiousity, there will never be another robin and angharad. Also richard morant, judy geeson, elizabeth townsend, clive francis, mary wimbush, ralph bates and paul curan will take some beating. i do have a suggestion for poldark, how about ioan grufford (who actually played jeremy in the poldark sequel flop!). no bimbo’s for demelza, lets keep her real. can’t you direct it at least robin? I was hoping to be seen for a role. The prospect of being scrutinised is making me a wee bit nervous!! Would an authentic Cornish Maid in the role tantalise any tastebuds? I too enjoyed watching Poldark during early motherhood (and reading the books – pounced on every new story as it was published). Very excited each time that lovely music started. Visited Cornwall in 1979 due to series and visited many locations. Bought your book there. Will watch with interested to see what they do with the remake. Perhaps Harris Pascoe for you this time? I think everyone would be delighted if you were in it somewhere! Thanks for the suggestion Annice-on verra–we’ll see! Exciting news indeed- but I think all original ‘Poldarkians’ cannot but be a little ambivalent about the idea. I simply think the original cast were so brilliantly suited to the storylines Graham cooked up! However if another Ross Poldark is even faintly possible, how about James Darcy? He’s a great actor, all round nice bloke and who has never got the ‘big part’ he really deserves. Or the Welsh guy who played Hornblower? Or, on a limb, the guy who played King Arthur in Merlin? As for Demelza…how about Carloine Catz or Lisa Faulkner? They were great fun in Murder in Suburbia. And Pauline Quirk as Prudie…!!! Another really good character actor I love is Sharon Small ( She was Inps. Lynley’s sidekick) but not quite ‘Demelza’ somehow…maybe Elizabeth or Verity? Robbie Coltraine could be old lawyer Pearce! Robin would indeed have to be in it somewhere, if only to satisfy all original Poldarkians! How about being Ross’s old uncle? That seems very logical! Bet you could do a great lawyer Pearce, mind you! One thing’s for sure: the original could never be matched for perfection of touch or the affection it aroused in us fans, the joy of the sincereity acting just oozed off the screen. It occurs to me to add that Lisa Fauklner already has a ‘Cornish track record’! She of course was the Primary School Headmistress in Doc Martin, being the fiance of the eponymous Doc! Thanks Janice–I’m excited it’s being done again. Once upon a time, long ago, a large creative team came together to make something magical and enduring. It pleases me to believe that a gathering of today’s talent can achieve another wonder. Ah, a fan’s reach should exceed her grasp— or what’s a heaven for? There must be hundreds of tall dark brooding handsomes out there with a range of acting experiences and stage combat skills. Same for the number of talented gamines and eccentrics. I think they’ll be most hard put to cast Captain McNeil- fearsome military bearing, invincible confidence, sharp mind, hard lean tempting body, thrilling voice— and a soupcon of goofiness that is somehow endearing. Among my girlfriends, when someone hits a rocky place in her romantic life, we have a little ceremony, sing a sea shanty and present her with exquisite red silk unmentionables…. in honor of a certain Poldark episode. She is sent back out into the fray, emboldened. Wonderful timing, Agnes–Donald (McNeil) is coming to lunch! It’s The Garlic Festival in Lautrec and we always (invariably) have a long table lunch. He will be much bucked by your deserved encomium. There is no end to his talents–we love him and will pass on the good thoughts! Thanks, Charlotte–I’m glad you have discovered the novels; we were lucky with our source material!